While smiles are intended to last a lifetime, there are times when the health and function of a smile are so severely compromised that it may take an expert treatment plan to repair. Full mouth rehabilitation is a detailed plan of restorative dental treatments designed to create a smile that is functional, aesthetic, and long lasting. Whether a mouth is suffering from severe decay, injury, gum disease, or missing teeth, Muccioli Dental has the accomplished expertise to restore smiles. Full mouth rehabilitation requires a carefully thought out planning process from start to finish. This detailed plan of restorative dental treatments will require the efforts of a dentist and a prosthodontics specialist. Dr. Randy Muccioli is an experienced dental restoration dentist who has additional advanced training in complex treatment planning, restorative dentistry, and tooth replacement. The on-site dental laboratory is staffed with highly trained dental lab technicians who are able to fabricate many restorations right here in our dental facility. By working with Dr. Lydia Muccioli, Dr. Randy Muccioli is able to offer comprehensive dental care throughout the entire process of full mouth rehabilitation. 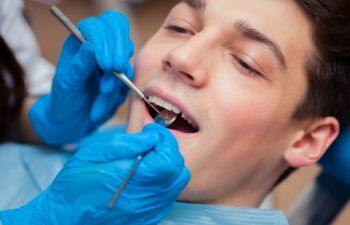 The entire process of full mouth rehabilitation can be an extensive treatment plan that requires several office visits. At Muccioli Dental, we offer all of our patients a comfortable atmosphere every time they come in. Drs. Lydia and Randy Muccioli take the time to give each patient an individualized treatment plan in order to reduce any anxiety that may come from visiting the dentist. Whether your smile is suffering from trauma, disease, or tooth loss, Muccioli Dental is here to help you achieve a functional and beautiful smile through full mouth rehabilitation.